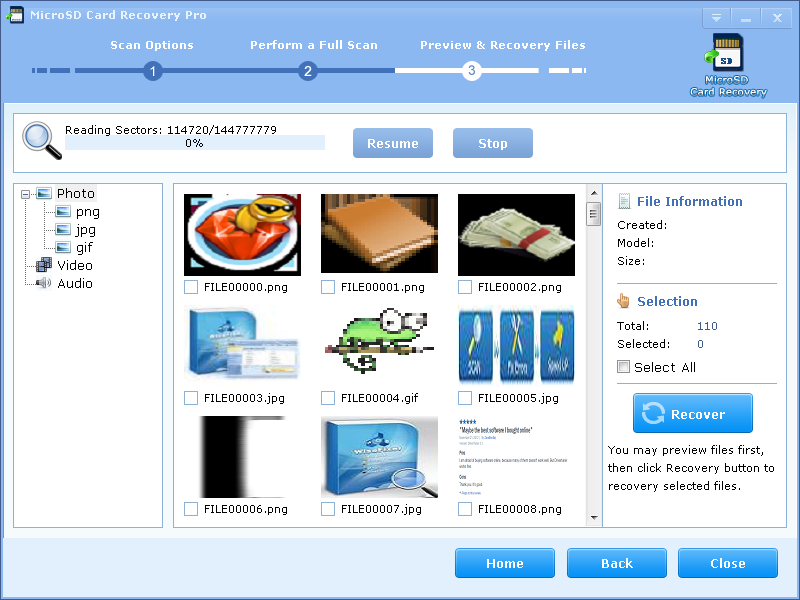 Best MicroSD Card Recovery Software, recovering pictures in 3 Steps! If you've lost data or whatever it is, MicroSD Card Recovery Pro is the professional choice for retrieving it. 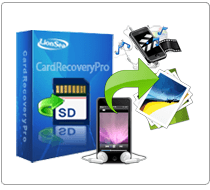 MicroSD Card Recovery Pro is easy-to-use and risk-free card recovery software that can effectively recover deleted or lost photos, music, video, and multimedia files from almost all digital cards after instances like deletion, corruption and formatting, etc. Using Card Recovery Pro is simple and efficient. MicroSD Card Recovery Pro is file data recovery software designed to recover lost files including video, documents, pictures, audios, and videos from memory cards, CD-ROMs, and lost pictures from digital camera memory. MicroSD Card Recovery Pro is identified is excellent recovery software, so it will still work even if your file has been severely damaged or formatted. For more safety, using MicroSD Card Recovery Pro is safe and risk-free. MicroSD Card Recovery Pro performs read- only operations on your memory card. It doesn't move, delete, or modify the data on the card to avoid causing further damage or overwriting the source. It recovers photos, music, video, and multimedia files from the source memory card and saves them to the destination location you specify in just a few steps. The advantage of MicroSD Card Recovery Pro is you can scan and recover your affected volume and shows you the files it is found prior to purchase. You can also preview your lost data or pictures thumbnails and choose what you want to undelete. That offers you efficiency and convenience. The policy is great too. You can have 60 days money back guarantee. Good service is another characteristic. If you have any computer problem and as long as you are not out of expired date, you can get the passionate and professional help from the company. That is to say you get a family computer technician for free. MicroSD Card Recovery Pro support all devices: Camera, SD card, Cell Phone, Memory Card, USB, PC, Mac, MP3 as many as you can imagine. 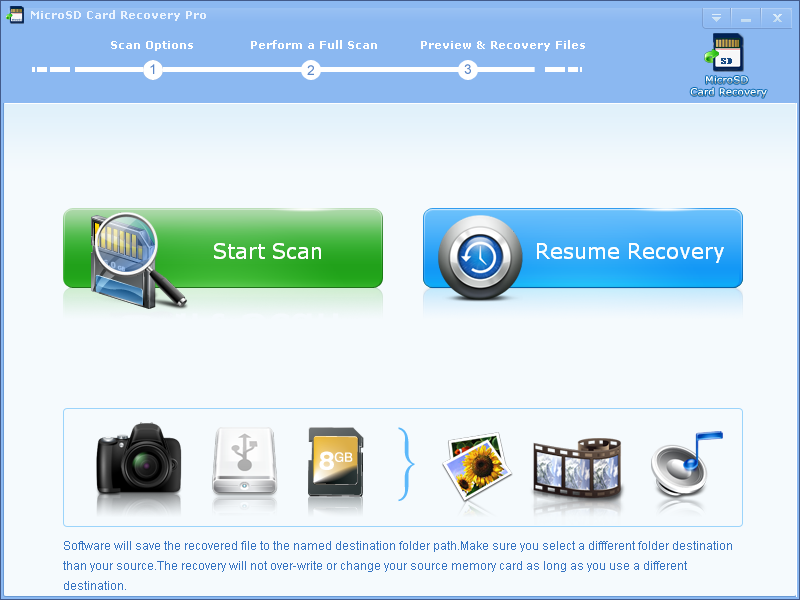 MicroSD Card Recovery Pro can be easily used by any user. Complete Do-It-Yourself and Risk free, only 3 steps: Connect device; Scan; Select files and recover! * MicroSD Card Recovery Pro will undelete all type of files on MicroSD card.